Helping the teacher grade quickly and accurately, this key is the teacher companion to Algebra 2 Quizzes/Tests (sold separately). 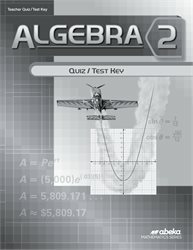 This is an exact copy of the student quiz and test book with all the answers and point values supplied. Solution steps are given in color next to the problems for each question that calls for the student to show his work. 180 pages. Recommended for grade 10.